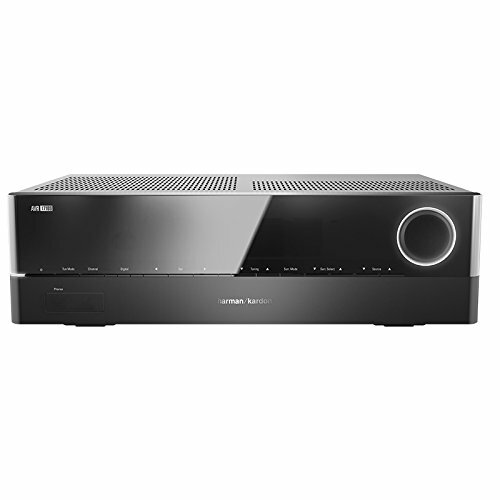 Introducing the Harman Kardon AVR 1610S, a powerful and versatile 5.1-channel audio/video receiver designed for those home entertainment enthusiasts who demand great sound and a variety of connectivity options. Equipped with fi ve HDMI 2.0 inputs, integrated Bluetooth technology and an MHL input, this high-performance AVR has everything you need and more. Because you have multiple ways to store and access your entertainment, it’s important that your audio/video receiver can deliver them. The Harman Kardon AVR 1610S features fi ve 3D-ready HDMI inputs (including one that’s MHL-compatible), HARMAN TrueStream Bluetooth technology, EzSet/EQ III calibration and compatibility with vTuner Internet radio. With the built-in Spotify Connect feature, you can stream music directly from your Spotify premium account on your phone, tablet or computer. So whether you’re connected via cable or streaming wirelessly, you’ll experience high-fidelity audio from this 425-watt, 5.1-channel, networked audio/ video receiver. It’s even lightweight, thanks to HARMAN Green Edge certification; you’ll get all the power you love, in an environmentally friendly form.